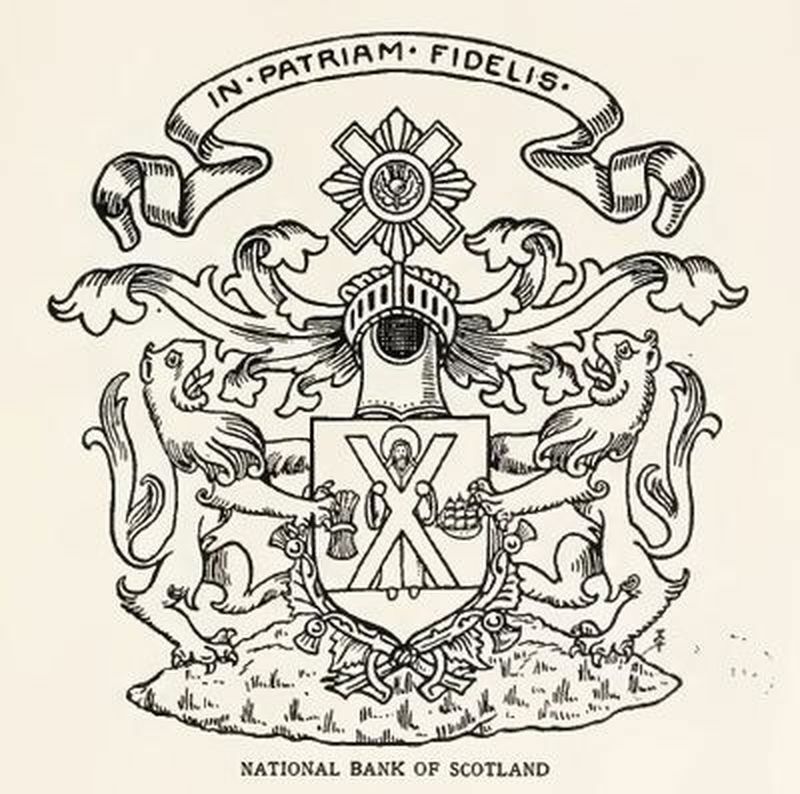 Coat of arms of The National Bank of Scotland is centered. In the center of the emblem apostle Saint Andrew dressed in purple monastic cloak. In front of him a silver cross martyr. He stands on the ground, to the right are the sheaf of hay in red color, to the left the ship in full sail (from the coat of Ship Bank). Bottom shield fit, proportionally, two branches of thistle, crossing below. Over embroidered royal coronet, Eskroll - feathers, a symbol of royal power (often used in heraldry). Above them, the motto - "In patriam fidelis" (Faithful family home). The supporters are 2 lions standing on its legs in red color. Coat of arms included in the Register of León in 1826. On right side is a Palace of Holyrood House. It is the official residence of the British monarch in Scotland. Located at the bottom of the Royal Mile in Edinburgh, at the opposite end to Edinburgh Castle, Holyrood Palace has served as the principal residence of the Kings and Queens of Scots since the XVI century, and is a setting for state occasions and official entertaining. Holyrood Abbey was founded by David I, King of Scots, in 1128, and the abbey's position close to Edinburgh Castle meant that it was often visited by Scotland's monarchs, who were lodged in the guest house situated to the west of the abbey cloister. James IV constructed a new palace adjacent to the abbey in the early XVI century, and James V made additions to the palace, including the present north-west tower. 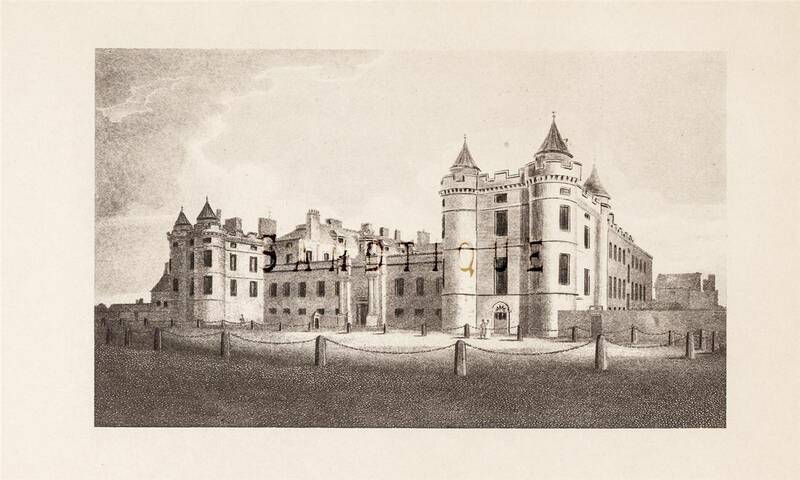 Holyrood Palace was re-constructed in its present form between 1671 and 1679 to the Baroque design of the architect Sir William Bruce, forming four wings around a central courtyard, with a west front linking the XVI-century north-west tower with a matching south-west tower. The Queen's Gallery was built adjacent to the palace and opened to the public in 2002 to exhibit works of art from the Royal Collection. HM The Queen Elizabeth spends one week in residence at Holyrood Palace at the beginning of each summer, where she carries out a range of official engagements and ceremonies. The XVI century Historic Apartments of Mary, Queen of Scots and the State Apartments, used for official and state entertaining, are open to the public throughout the year, except when members of the Royal Family are in residence. On right side is the Glasgow cathedral. 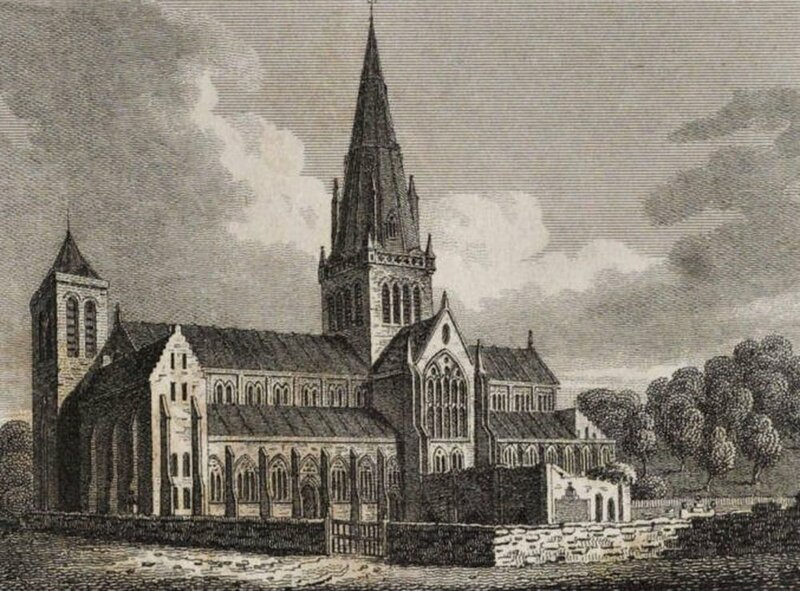 Glasgow Cathedral, also called the High Kirk of Glasgow or St Kentigern's or St. Mungo's Cathedral, is the oldest cathedral on mainland Scotland and is the oldest building in Glasgow. Since the Reformation the cathedral continues in public ownership, within the responsibility of Historic Environment Scotland. The congregation is part of the established Church of Scotland's Presbytery of Glasgow and its services and associations are open to all. 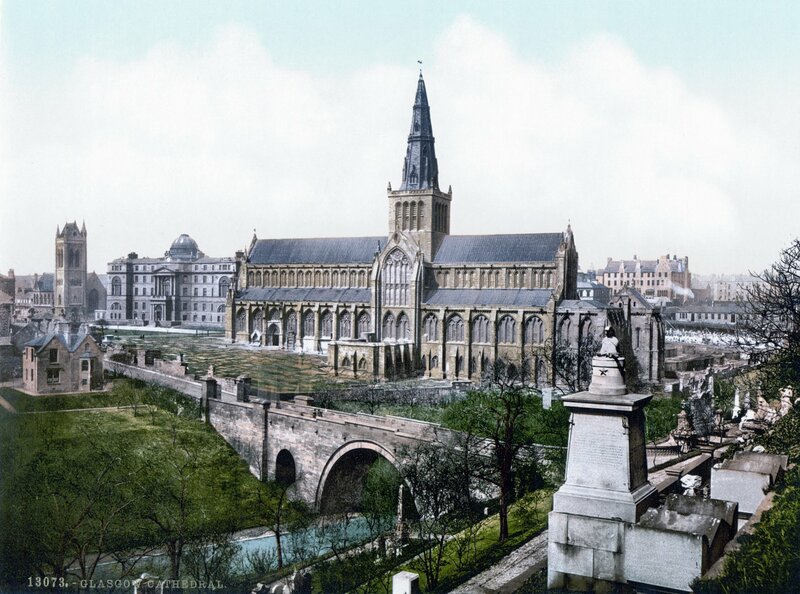 The cathedral and its kirkyard are at the top of High Street, at Cathedral Street. 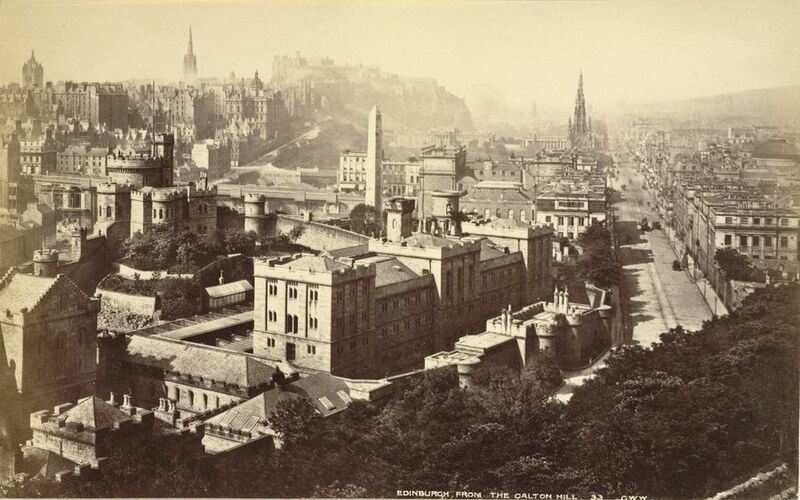 Immediately neighbouring it are Glasgow Royal Infirmary, opened in 1794, and the elevated Glasgow Necropolis, opened in 1833. Nearby are the Provand's Lordship, Glasgow`s oldest house and its herbal medical gardens, the Barony Hall (Barony Church), University of Strathclyde, Cathedral Square, Glasgow Evangelical Church (North Barony Church), and St. Mungo Museum. Built before the Reformation from the late XII century onwards and serving as the seat of the Bishop and later the Archbishop of Glasgow, the building is a superb example of Scottish Gothic architecture. It is also one of the few Scottish medieval churches (and the only medieval cathedral on the Scottish mainland) to have survived the Reformation not unroofed. The cathedral has been host to number of congregations and continues as a place of active Christian worship, hosting a Church of Scotland congregation. The building itself is in the ownership of the Crown, is maintained by Historic Scotland, and is a popular destination for tourists. Denominations in numerals are in all corners, in words centered and on bottom. The panel with a pattern. The Pattern made ​​under precisely undershirts of classic vintage postcards. Inside is the view of the of Edinburgh from Calton Hill (the hill in the center of Edinburgh, east of Princes Street). Although, Scotland is not an independent state, and is part of the UK. 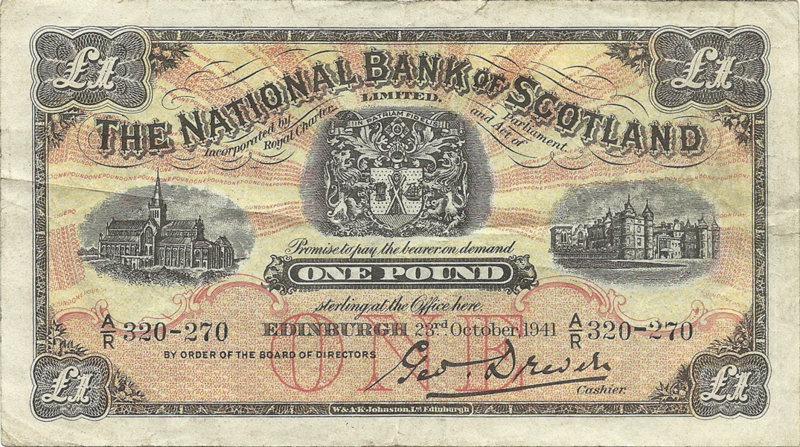 Three Scottish banks have the right to issue their own banknotes. 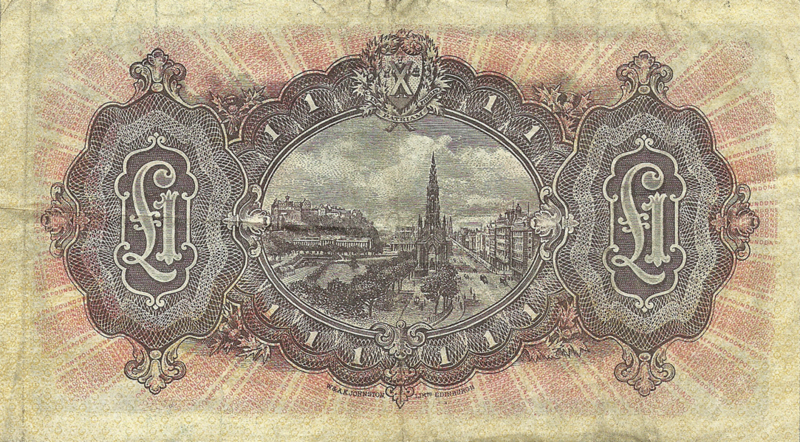 Officially, these notes are not called "Scottish pounds" and their denomination designated in pound sterling. 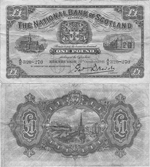 In the strict sense of the term "Legal Tender" banknotes of Scottish banks are not even legal tender in Scotland, but can be taken throughout the United Kingdom.